Premier Kathleen Wynne says she's all for anything authorities can do to find a missing child. 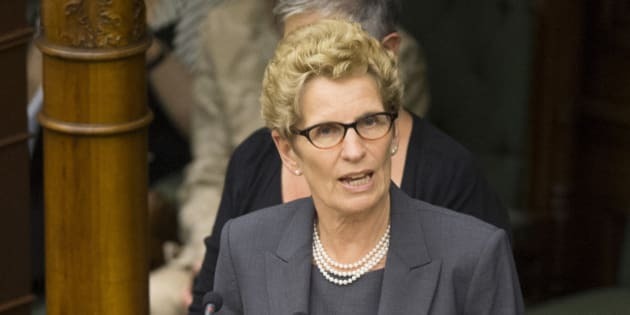 TORONTO — The premier of Ontario says she wasn't upset when an Amber Alert popped up on her TV screen as she was watching "Downton Abbey" on Sunday night, but that wasn't the case for many Ontarians who called 911 or took to social media to complain. Kathleen Wynne says she's all for anything authorities can do to find a missing child. The provincial police says it is dismayed by the reaction of some in the public who complained that they were inconvenienced by the alert issued in an effort to find a missing child. @AMBERalertONT in middle of finale for Downton Abbey #badtiming#wned stop amber alert it's 5 min already. @Rogers@RogersHelps What happened to to audio on #DowntonAbbey after the #AmberAlert ??????? It was the first time the provincial police used the enhanced National Alert Aggregation and Dissemination system to advise about a missing eight-to-13-year-old boy that callers said was physically taken and forced into a vehicle in Orillia, Ont. Insp. Pat Morris says the force tried the traditional investigative techniques to locate the boy, which included news releases to the media as well as taking to social media to spread the word. He says time was against them so they decided to initiate the new system, which appeared as a red box over top of a broadcast, alerting viewers about a silver Toyota Sequoia in Orillia going to an unknown location. The boy was later found unharmed. "In this case, the Ontario Amber Alert led to numerous calls from concerned citizens who provided us with information on the whereabouts of the young boy," Morris said in a statement. "Immediate followup confirmed his location and well being." "I think an alert that was that pervasive and that obvious to people was a very good thing." Wynne was supportive of the new system. "I think an alert that was that pervasive and that obvious to people was a very good thing," she said. "I was very impressed actually that it flashed on all of our TV screens right at a time when a lot of people would have been watching a show on a Sunday night." Kathleen Wynne says she saw the amber alert last night while watching TV. Reporters ask her what she was watching. Ontario's Amber Alert is a voluntary co-operative plan between the Ontario Association of Broadcasters, law enforcement agencies, and the provincial transportation ministry. Amber Alert uses highway message signs, radio, television and cable to immediately broadcast descriptions of kidnap victims, their abductors, and suspect vehicles.